Reading the June 2015 issue of Woman's Day magazine - and yes, I admit that I have a subscription to Woman's Day for the fun craft ideas, recipes, money tips, and travel ideas - I loved the June "Kindness Project" focusing on Healthy, Happy Babies. The article highlighted Shannon Buist, a mom who realized that shelters and food pantries need more than just clothing and food. One of the most needed items at these locations are diapers, as they are so expensive for low-incoming families, not covered by government assistance programs, and reusable ones are challenging to find places to be allowed to launder them. Plus, many early childhood education programs only allow children with diapers to enroll and participate. Shannon Buist created Dry Baby Bums, an organization located in her hometown of Park City, Utah in 2014 to spread awareness of the need of diapers at her local shelter. DBB collects diapers, wipes, and other baby bum necessities through local fundraisers and donates them to shelters and food banks. Not in Utah? You can still give back by donating online through Feeding America or your local food bank; donations of creams, wipes, and diapers are also accepted at most food banks and shelters across the nation. 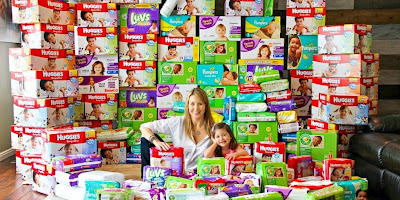 Other organizations on a mission for diaper donations include the National Diaper Bank Network's partnership with the Huggies' Every Little Bottom program, as well as the Global Moms Challenge supported by Jennifer Garner. Call or email your local shelter to ask about their greatest needs and do a drive with your friends and neighbors to raise awareness for those needs and help to alleviate them.